YMCA Lincolnshire is playing host to a knight in shining armour at The Showroom on Tritton Road. The Knight of Minster is seeking refuge at The Showroom Conference Centre until he can find more permanent accommodation. In medieval times it was common practice for people of influence to be captured. The Knight of Minster experienced something similar when he was held to ransom following the Knights’ Trail in 2017. Thankfully for the Knight, Investors in Lincoln paid £6,000 for his release. David Rossington, Chief Executive of Investors in Lincoln, said: “We were pleased to help the Knight, particularly as the funds went to good causes across Lincoln. The Knight had originally sought refuge at Lincoln Cathedral where he guarded the Cloisters until having to leave at the end of last year. 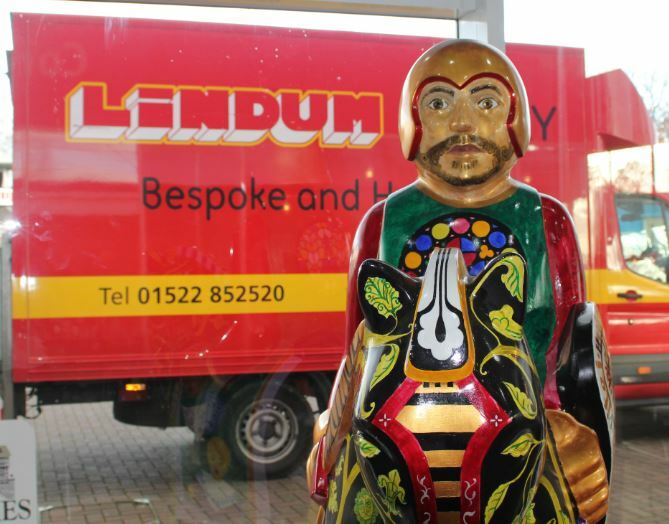 The Lindum Group kindly gave the Knight of Minster safe passage over the New Year, smuggling him out to YMCA Lincolnshire in January, where he will be safe for a while. Caroline Killeavy, CEO at YMCA Lincolnshire, said: “We’re delighted The Knight of Minster has arrived to spend some with us. We’re all very excited, he’s really brightens up our café at The Showroom.